"It ain't fashion - it's just rock & roll." Huntington, West Virginia. 1984. Danny Hutchens and Eric Carter were playing guitar and writing songs together, as they'd been doing since they were teenagers in the small southern West Virginia town of Ravenswood. Joe Geiger played drums hard, and he played them fast. I was going to Marshall University and working in a local theater chain to make ends meet. Danny'n'Eric heard me goofing around with a bass guitar in the attic of a classmate's rented house, and thought I'd be an okay bass player for their new band, tentatively called "Spare Change." Wasn't long before I was playing along on Danny's white Fender bass, as a part of what soon became The Wreck. We played the songs that Danny and Eric wrote, like "Boat's Gonna Sail" and "New Horse and Carriage," at parties around Huntington and in several well-received gigs at the Monarch Café. One of these, in fact, marks the only time (so far, at least) that I've actually been paid for performing music. Eventually, Daniel (as he's now known) and Eric moved out of Huntington to Athens, Georgia, where they've been performing for many years now as Bloodkin, with a string of CDs variously available as side projects from Widespread Panic records: Good Luck Charm , Creeperweed , Out Of State Plates , All Dolled Up , The Bloodkin Community Gospel Rehab and, most recently, Ravin' Beauties . Bloodkin was also featured on the Athens compilation CD Five Ring Circus . Check out Sloan Simpson's Athens website for details - and MP3s - of a show at the Caledonia on April 26, 2005. Daniel Hutchens has managed some significant accomplishments on his own, as well, having accompanied Maureen "Moe" Tucker and the late Sterling Morrison of the Velvet Underground, as acknowledged in the liner notes of LIVE MCMXCIII , recorded in 1993 at L'Olympia Theater in Paris. On March 1st, 2003, he released a solo album of mature, somber acoustic music called Lesser . You might want to check out his own site for further info. Me, I stayed in Huntington to continue working towards my B.S. degree (ambiguity at least somewhat intentional). An involuntary change of jobs led to me working at Chili Willi's Mexican Cantina, where I met Mike Gibson and Tim Flanery. We turned out to be at least as interested in playing music as we were in washing dishes. Together with friend and Marshall University Science Fiction Society (MUSFS) alumnus John Crist, we formed Wenton Gone. ©1998, 2003, 2005-2007 Alan P. Scott. 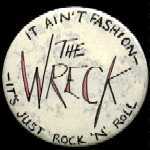 Artwork (promotional button) ©1985, Alan P. Scott. All rights reserved. Last updated January 14, 2007.